The Bristol Tower, designed by Luis Revuelta, is one of the most beautiful buildings in Miami as it soars 40 stories above the blue waters of Biscayne Bay. This condominium is surrounded by lush landscaping and has ideal bay front access. Expect to find residential features like designers’ kitchens, large balconies, private elevator leading to private foyers and the exquisite panoramic views that Brickell condos are known for. Bristol Tower tops it off with glamorous amenities including private elevators, gated entrance, 24-hour security, tennis courts, pool, a cutting edge fitness center, cafeteria, terraces, covered parking and valet. Bristol Tower is jam packed with appealing features to make the most of its one of a kind experience. 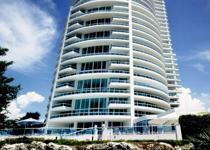 Ugo Colombo has played a pioneering role in the development of Miami’s bay front skyline. He is widely regarded as one of South Florida’s most respected and successful residential and commercial developers. Being involved on epic projects, Colombo has redefined the architecture and the life style of this metropolitan city. Revuelta Architecture International was founded with a commitment to provide quality designs balanced with sustainable and economically feasible solutions, delivered within stringent time schedules. This philosophy, over the past two decades, has been the cornerstone of the success of many of our projects. Being leaders in South Florida’s landmark residential and commercial developments.